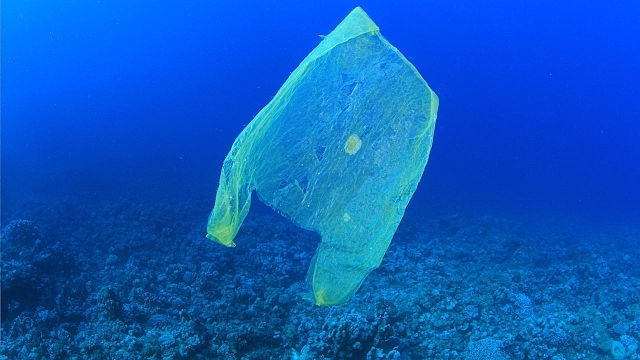 Shopping bags, the most abundant floating macro-litter objects in the sea. New study gives insights on macro-litter interaction with marine mammals in the Mediterranean Sea. Marine litter is of global concern. Every year worldwide, much of the 300 Million tons of litter, and specifically plastic, that we humans use end up in our oceans. As a result, our oceans have turned into a big landfill that has several impacts on the marine system and to human health. Now scientists investigated specifically the interaction of macro-litter with marine mammals, also known as wildlife entanglement. Wildlife entanglement is one notable type of impacts from marine litter. In the last decade, wildlife entanglement of marine debris by marine animals has increased by 40%. It is already well known, that animals, such as such as sea turtles, seabirds, and marine mammals can ingest marine litter. These marine animals are mainly affected by floating plastics at the Sea. Scientists calculated in 2014 that floating plastics are more than 5 Trillion Plastic Pieces Weighing over 250.000 Tons in the World’s Oceans. A new study gives now insights on the interaction of macro-litter with marine mammals in the Mediterranean Sea, specifically in the French coast. In this study, scientists warn about the potential interaction of macro-litter with mammals. In previous studies performed in different seas, high numbers of floating litter have been reported close to shipping routes, high populated coastal areas, and oceanic current systems. Specifically, the Mediterranean Sea is a particularly sensitive ecosystem and marine waste is threatening it. The Mediterranean Sea is a semi-enclosed sea and the human pressures on it are high. As a result, the Mediterranean Sea has the highest concentration of marine waste in the world. “Given the biological wealth and concentration of economic activities in the Mediterranean Sea, the effects of plastic pollution on marine and human life could be particularly relevant in this plastic accumulation zone”, stated Andres Cozar from the University of Cadiz, Spain. Ingesting plastic can be very dangerous for marine mammals, even deadly. Already in the 90s scientists pointed out the impact of waste on marine mammals and other studies have shown that litter concentrates in areas where marine mammals feed. The threatening level of marine litter varies according to species and type of debris. In a review of literature, research on marine litter and marine mammals revealed that hundreds of cases in which marine mammals (whales, dolphins, and porpoises) have sickened or killed by marine litter in the last two decades. 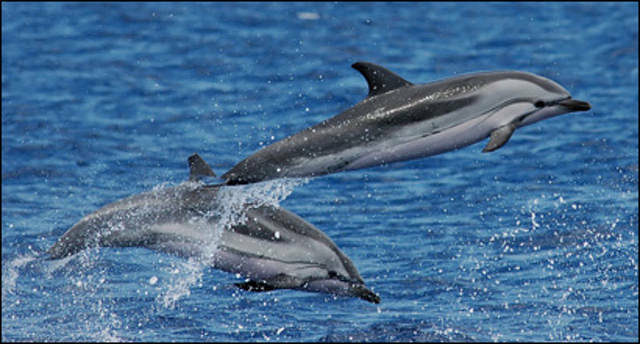 Specifically, in the Mediterranean, many cetacean species of both oceanic and coastal habitats had interactions with plastic: Cuvier’s beaked whale, fin whale, sperm whale, striped dolphin and bottlenose dolphin. To gain insights on the interaction of macro-litter with marine mammals the researchers Dr. Nathalie Di-Méglio (EcoOcéan Institut) & Dr. Ilaria Campana (CISMAR) carried our surveys in the Mediterranean Sea. More specifically, they performed their research along the Mediterranean French region of Provence-Alpes-Côte d’Azur focusing on the Liguro-Provençal basin. For almost 10 years the researchers collected data on composition, abundance, and density of floating macro-litter. They sighted around 2000 objects, out of which the majority was plastics (86.7%), mostly represented by bags (65.9%) and bottles (8.2%). By pooling the data of plastic and the marine mammals’ sightings, they found that in more than 50% of the area, plastics and marine mammals were overlapping. Their results indicate a high potential interaction of marine mammals and floating marine litter. More details about the study and results can be accessed via Marine Pollution Bulletin. To help shrink the amount of waste that ends up in our oceans that kills marine wildlife and threatens our health there are three key steps: reducing, reusing and recycling. You could reduce the amount of plastic you’re consuming. Bring your own reusable bags when you’re grocery shopping. Apply recycling to your everyday life by starting in your own home. Or the next time you go to the beach remember to clean up after yourself and apply the “leave with what you came with” principle. You could even pick up after more litter that someone might have left behind! STORY SOURCE: The above post is written based on materials from the Marine Pollution Bulletin and sources as indicated within the article. Note: Materials may be edited for content and length.